Teenagers with a firm faith foundation, who know what they believe and why, aren't easily swayed by others who might challenge their faith. This book gives you the tools to work with the very basics of faith--who God is, who Jesus is, why we need a Savior. And lessons use active learning--so there's no boring lecturing or endless notetaking. Teenagers apply their beliefs to daily living and discover...Why evil is in the world--by acting out parts of Job's life, How to be more like Jesus--by looking at their surroundings through a pair of "Jesus" glasses;Who the Holy Spirit is--by comparing the properties of ice, water, and steam. 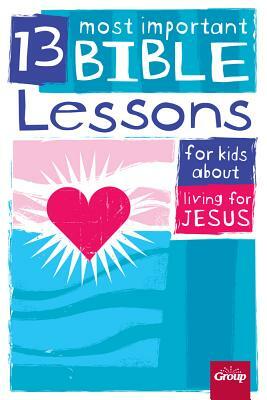 Lessons use active-learning techniques to hold teenagers' interest and keep them involved And each lesson gives a biblical perspective to faith issues, such as Creation and Jesus' return. With concise instructions and easy-to-use handouts, you'll be able to help teenagers learn these vital concepts with ease. Use the lessons one at a time to build your group's understanding of the basics. Or use the material in a confirmation class or a class for new Christians. Lessons also work well for Sunday morning classes or youth meetings. Introduce your teenagers to the foundational beliefs of the Christian faith with "The 13 Most Important Lessons for Teenagers."